For many people their first experience of honeybee management comes with the arrival of a swarm in their or a neighbouring garden. Don't be alarmed - honeybees expand in population during May, June or July. If they find themselves short of space they will leave their home and search for another one. They congregate temporarily, often on a convenient post or bush, while scout bees look for suitable locations for a new permanent home. 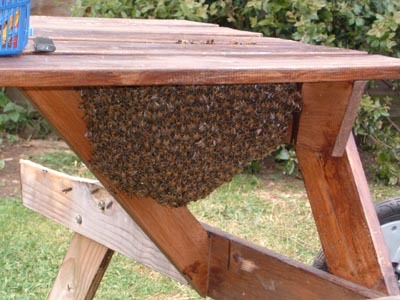 If a beekeeper can collect this swarm and house it in a waiting hive (it is recommended that one always have a spare hive available for this purpose). It may be housed in comfort and safety, and may eventually produce honey. 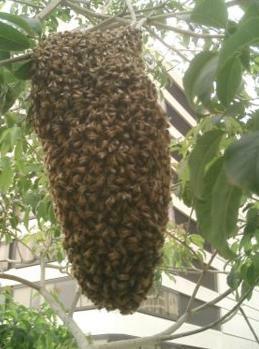 It is also prudent to have a spare hive, with some drawn comb inside, as this may attract passing swarms. Although a flying swarm may look and sound a little daunting the bees are in no way aggressive and will take little or no notice of you. If you need to pass the swarm, you may want to cover your hair as a precaution. Don't interfere with the bees - if the Bees are a problem please contact a local beekeeper either directly or through your local council. False Alarms - a.k.a which insects am I seeing? How do you know whewther you have honeybees or something else? These bees are almost completely harmless and you are very lucky to have them living near you. Leave them alone. Do the bees live in a small space such as a birdbox, hole in the wall, or underground? They're probably other types of bee. These bees are almost completely harmless and you are very lucky to have them living near you. Leave them alone. Are the insects smooth, with very pronounced yellow and black stripes, with red legs? These are probably hornets. Native British hornets are rare and generally harmless so long as you don't annoy them. Leave them alone. Are the insects smooth, with very pronounced yellow and black stripes, with black legs? These are probably common wasps. Wasps do an excellent service in keeping down the number of flies and other bugs. Leave them alone. If you see this insect, with a bright orange "bottom", it could be the Asian Hornet. Please report its presence to the non-native species secretariat.